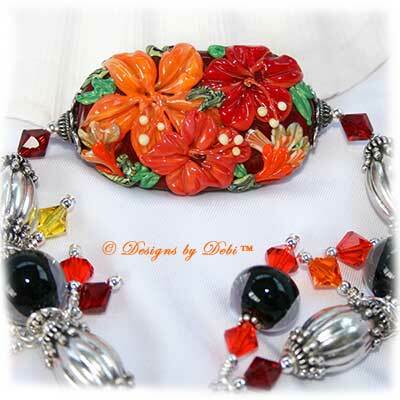 The centerpiece of this bracelet is a gorgeous oblong hibiscus artisan lampwork bead handmade by Susan Elliot of Doodletart Glass. 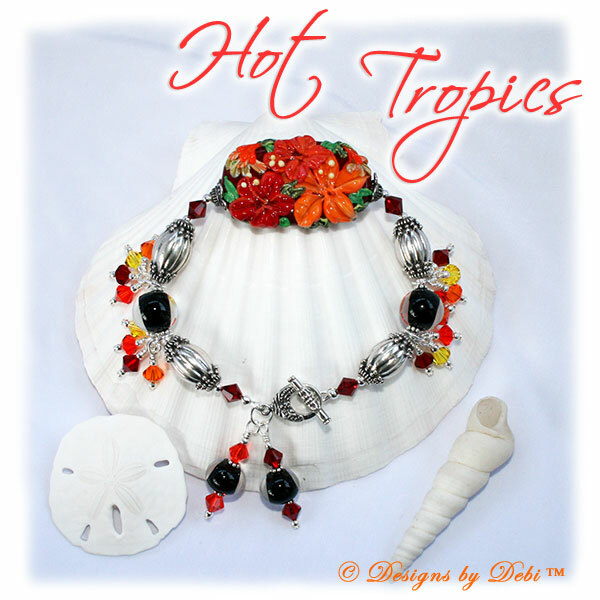 It's a beautiful ensemble of red and orange hibiscus that bring to mind the vibrant colors and warm weather of the tropics. 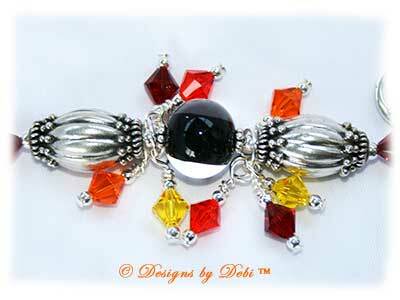 The clear-encased black lampwork beads were also made by Susan. I accented her precious work of art with intricately detailed large silver beads and daisy spacers handmade by silversmiths in Bali, Indonesia. 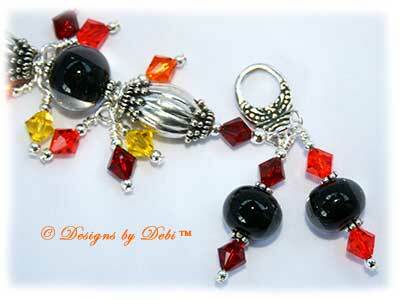 To add some fun movement and interest, I hung dangles of Swarovski® crystal bicones in siam, hyacinth, sun and citrine with sterling silver accents on either side of the black glass beads. 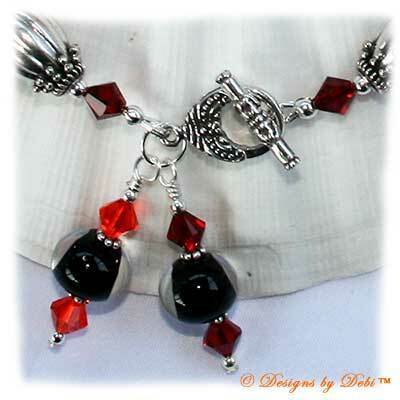 There are also 2 large dangles hanging near the sterling silver toggle clasp which has a coordinating granulated design. The charity I've chosen to receive the donation from this month's piece is Stand Up 2 Cancer. The color scheme was selected to match the colors in their logo...black, red, orange and yellow. Cancer takes one life every minute. We have all been touched in some way by some form of cancer; whether it was ourself, a family member or a friend. Stand Up To Cancer is an initiative that was created in 2008 to urgently move cancer research forward. This is where the end of cancer begins: When we unite in one unstoppable movement and Stand Up To Cancer. The power of collaboration and cooperation are at the heart of SU2C and they are funding research to end suffering from all types of cancer. Their innovative approach to research is designed to eliminate barriers that have traditionally inhibited creativity and collaboration; enabling the best and brightest investigators from leading institutions across the country and around the world to work together by investing in their projects and taking the bureaucratic obstacles out of their way. The unique funding model used to accomplish this goal administers funding through two types of scientific grants...Dream Team Grants and Innovative Research Grants. Dream Team Grants are awarded to multi-institutional, collaborative groups of scientists, clinicians, technicians and other experts pursuing the most promising, cutting-edge research. These teams are discovering new therapies for cancer patients and advancing efforts in cancer prevention research that could quickly provide direct patient benefit. The research being done by the Dream Teams already at work has the potential to impact the diagnosis and treatment of a wide range of cancers that are responsible for two thirds of the cancer deaths in the U.S. Innovative Research Grants provide support for cutting-edge cancer research being undertaken by individual investigators and their lab teams that has strong potential to impact patient care within a short timeframe. Scientific advisors look for novel ideas that are considered high risk and would often not be supported by conventional funding sources because they understand that these high-risk ideas also offer the potential for high reward in terms of lives saved. Funds are administered by the American Association for Cancer Research. Together with their scientific Blue Ribbon Advisory Committee, comprised of world-class scientists across several disciplines and patient advocates, they identify the most promising projects. Data is shared across institutions, and scientists long accustomed to competing are now united in the struggle against a common enemy...cancer. Stand Up To Cancer has already helped raise over $100 million and 100% of donations go to collaborative cancer research. To find out more about Stand Up to Cancer or to make a donation on your own, go to www.StandUp2Cancer.org. 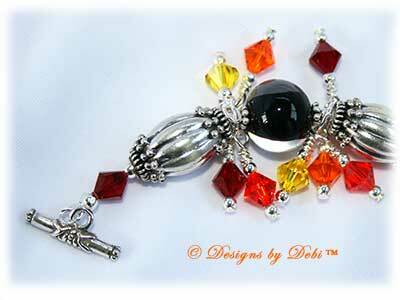 The bracelet measures 9 inches and will fit a 6 1/4 inch (very loosely, but secure) to 7 inch wrist. If you need the bracelet re-sized, please let me know at time of purchase and this can be done prior to shipment at no additional charge.